Do you get lost in negative thoughts for hours or days when you stumble, fail or face uncertainty or tough times in life? Do you sometimes feel like there isn’t much point in even trying because you just know you’ll disappoint yourself or be disappointed in the results you’ll get? Or do you often try but just as quickly give up again on what you dream about? Do you feel like you have not lived up to your potential yet and are quite often discouraged by what you have accomplished in life so far? And do you think you’d have more success in love, friendship, your career, finances or your health if you were more of an optimist? Well, being in such a place is not uncommon. I used to be in that place. I was stuck in pessimism and self-imposed limits. And many are there today in various degrees. 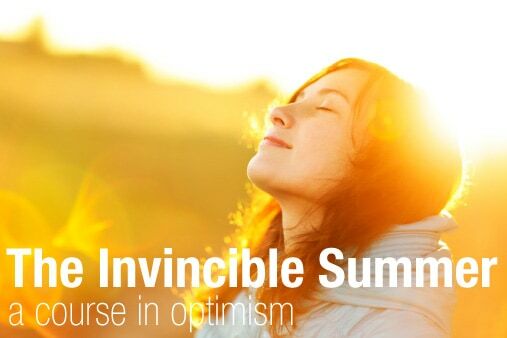 That is why this course, my brand new 8-week course called The Invincible Summer is all about improving and strengthening your own optimism step-by-step. So that you can be happier, stronger and more resilient during the tough times and more successful in your life. Being in a place of a lot of negative thinking is not a good but an all too common place to be in the world today. I know. Because I was stuck there for a long, long time. But I have also made the journey over to a much more optimistic viewpoint. And it is like the world has changed over these years. Not only out there. But also inside of me. Because a pessimist and an optimist may look at the same situations in life but see very different things. Let me share a three examples from my own life and from these two very different perspectives. When I was a pessimist I had pretty much given up on dating and finding someone. But by making the switch to being an optimist I became more easygoing and attractive socially. I found a strength to take action, to stay resilient and to keep going despite bad or so-so dates and many rejections with my enthusiasm intact. And today, and for the 4 years, I have been with a most wonderful woman. When negative thinking filled my mind I didn’t have that much hope of finding a job my university studies. But with the optimistic perspective to support me I dared to dream of and was able to create not only a popular website but also – through many trials and errors and a lot of missteps – an online business of my own that I am now able to work with full-time. With pessimistic mindset I ate too much and moved too little. I didn’t find much point in doing anything about those things and frankly didn’t think I could anyway. And so I got out of shape during my twenties. But by tapping into optimism and taking action on that I was able to lose 26 pounds and establish much healthier habits that I have stuck with for 5 years now. Uncovering my own optimism and fueling that inner sunshine is one of the best things I have done in my life. My love life and my health would not be in those great places they are now and I would not be able to make a living from my passion without that extremely powerful change in how I thought and acted. Having a healthy sense of optimism is much like building and maintaining your personal physical fitness. It is not something you do once and then it is fixed for the rest of your life. But in this course I’ll give you the tools to build it up and then you can run with it and keep it up week after week and month after month, through life’s ups and downs and on the winding path towards your own small and big and wonderful dreams, adventures and goals. Each week for 8 weeks you’ll get a part of the puzzle of resilient and life-expanding optimism. Adopt the optimistic outlook so that you can unlock your true inner potential. Keep your enthusiasm up so that you will keep going despite the setbacks, mistakes and failures that make most people quit. Create of more opportunities around you in your life. And help you to find more of the ones that are already there but you simply can’t see at the moment. Face uncertainty so that you will react and act in an level-headed and constructive way when a tough time hits. Practically build an environment of optimism around you that will open up your life and mind. Become a person of consistent and persistent daily action so that you don’t procrastinate or get lost in daydreams for the hundredth time. Overcome the destructive victim mentality so that you feel more deserving of the success you want and don’t self-sabotage. Handle criticism from other people so that it – or the fear of the criticism – do not hold you back in life (even if the words they say get under your skin). Turn the self-doubt that we all struggle with at times around so that you can keep taking action towards making your goals into reality. Get out of your own way and start living the life you deep down want to live. I am so confident that this course will help you that it comes with a 60 day money back guarantee. So it’s a risk-free deal for you. If you aren’t satisfied that The Invincible Summer Course is helping you improve your life or you don’t like the material for any reason at all then just let me know via email and I’ll refund you in full with no hard feelings and no questions asked. I have kept things very simple for this course. And you have two options when it comes to how you want the course delivered. You can either get it in small, weekly parts via email. Or you can download the whole course today (if you want this option, scroll down a bit). If you choose the “one-small-part-each-week” option then you will each week get a short guide with just a couple of clear action steps at the end of the guide to take that week. I have added this weekly option to lessen the chance that you get overwhelmed, stuck in analysis paralysis or start procrastinating. I want as many as possible not only to read the information but also to take small actions each week to build their optimism and positivity within and be able to better maintain it. So, with this option you will each week get a new email containing a written guide in PDF format with strategies, practical tips and clear action-steps to take. And, as mentioned earlier, many of the things in this course are things I have never even mentioned on my blog or in my newsletter before. The Weekly Worksheet. One worksheet per week in PDF format containing essential exercises to help you to better understand yourself, your own situation in life at this moment and how to improve it. The Weekly Audio Session. An audio version of the weekly guide in downloadable MP3 format that you can listen to on the bus, in your car or while walking to work or school. Or before an important event in your life. That’s 8 extra worksheets. And 8 audio sessions in mp3 format. There is a time for a real change. A time to stop holding yourself back and to start living the life you deep down want and dream about. If you like, that time can be now. So let’s get started. Click the Add To Cart button below and then after you have completed the purchase you will within a couple of minutes receive an email containing a link (please check the spam folder too in case it winds up there). Click that link in the email and you’ll be taken to a webpage with some very simple instructions to follow to gain access to the course. You’ll get a new email every 7 days with that week’s download links for the full 8-week duration of the course. Join us now in The Invincible Summer Course for just $29 (that’s for the whole 8-week course). You don’t have to subscribe to the email option and get the course in small weekly parts though. You also have the option to get the whole Invincible Course right now. You will then gain instant access to all the 8 weekly guides, the 8 worksheets and the 8 audio guides in just a few minutes. Click the button below to get access the whole Invincible Summer Course right now for just $29. P.S: I spent many years to get to where I am today. I don’t want you to have to spend that much time struggling to find your way out of negative thinking, squandered potential and being trapped in a negative rut. Instead, start a new phase in your life today. And remember, you have a 60 day, no questions asked and no hard feelings money back guarantee so you can check out the Invincible Summer Course with no risk for you.